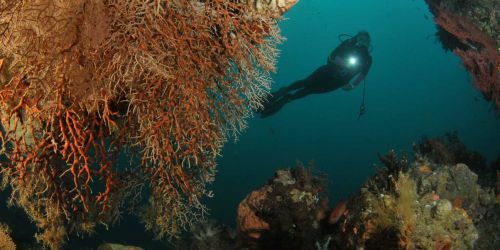 The Banda Islands provide magnificent diving and snorkelling, considered by many to be the finest in the world. These placid tropical islands are surrounded by unspoiled coral gardens vibrantly alive with a multitude of colourful, unique, and often quite rare marine life. 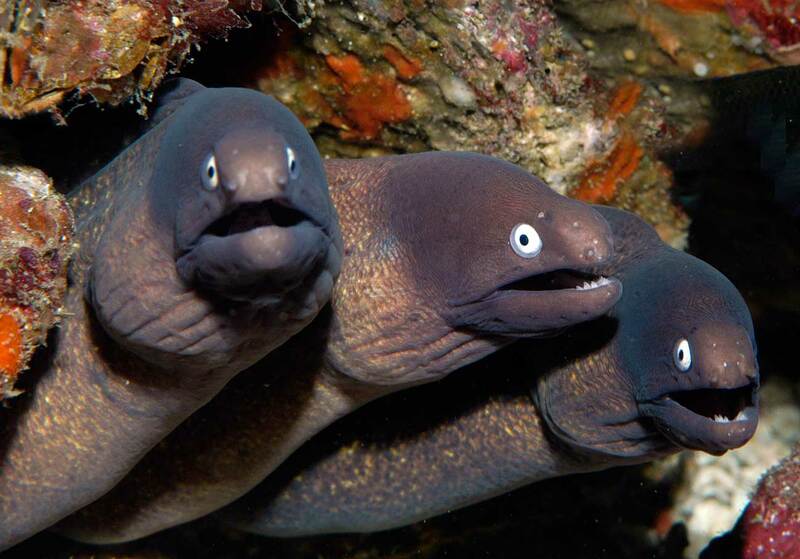 Rated among the world's top 5 diving destinations, these islands are a paradise for divers of all levels. With crystal clear water, 500 varieties of marine life, and 300 types of coral these healthy reefs teem with live coral and more fish species than your camera can capture. 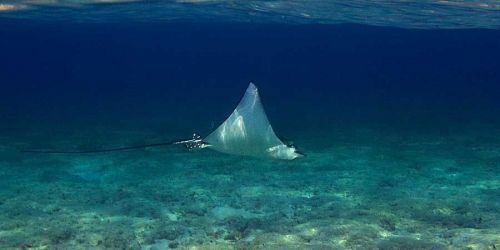 In this underwater nirvana dogtooth tuna and giant rays mix with enormous schools of fusiliers and red tooth trigger fish. Huge gatherings of hammerhead sharks are often seen. 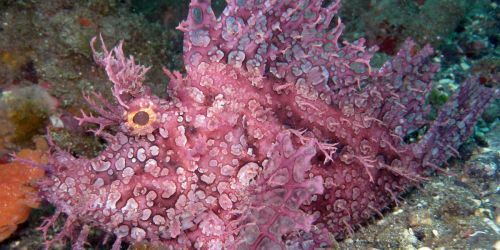 On a smaller scale, are rare mandarin fish and unique Ambon scorpion fish. Spinner dolphins, orcas, and melon head, pilot, blue, and humpback whales are frequent visitors. 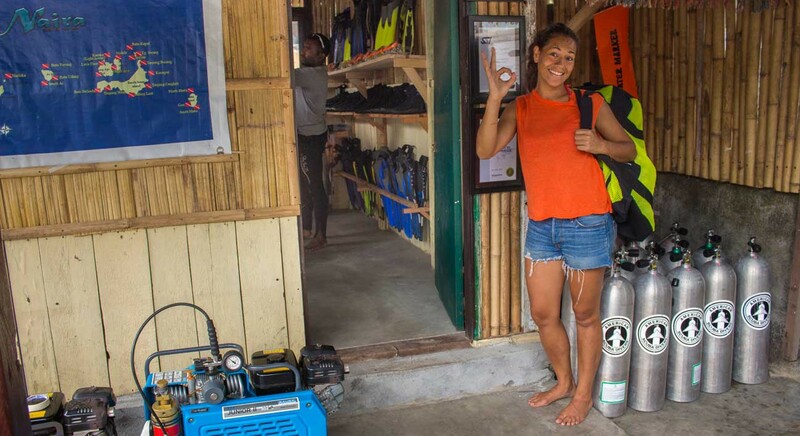 Diving is comfortable, with mild current, good visibility and calm water, but some sites are subject to strong currents and only suitable for experienced divers. Pulau Ai - A remote island west of Banda Neira has limestone cliffs on its southern coast and lovely beaches on the northern shore. Due to its isolation and surrounding deep water, Pulau Ai is a top dive site for sharks. Hammerhead are frequent, along with thresher and silvertip. Wahoo and giant trevally mingle with large schools of chevron barracuda and blue fin trevally. Squadrons of mobula rays, fly in formations up to 20 strong. Batu Belanda - 'Dutch Rock', where the Dutch first landed, is famous for the rare Lembeh sea dragon. With the elongated body of a pipefish and head of a seahorse it attaches to black crinoids employing its host for protection. The wall has yellow, blue, and violet sea squirts, barrel sponges, green cup corals, orange corals, and rare Ambon scorpion fish. Napoleon wrasse and bullet head parrotfish frequent the area. Pulau Hatta - Karang Hatta, was named after the first vice president of Indonesia, Mohammad Hatta. The Sekaru, meaning 'shallow area', is a wide reef several kilometres south of the Island. The southeast corner of the reef has a southerly current, which attracts fish in their thousands. Endless cascades of neon fusiliers mix with blue and yellow fusiliers so thick you cannot see past them. Large dogtooth tuna, eagle rays, giant barracuda, and hammerhead sharks are common. In shallower water big-eyed trevally, and unicorn fish prowl the corals in search of blue dash fusiliers, red tooth triggerfish, pyramid butterfly fish and juvenile yellow snapper. Green turtles patrol this atoll feeding on sponges while mobula rays and white tip reef sharks often snooze on the bottom. Several species of hawk fish, soldier fish, grouper, tube lip wrasse and titan triggerfish are common. 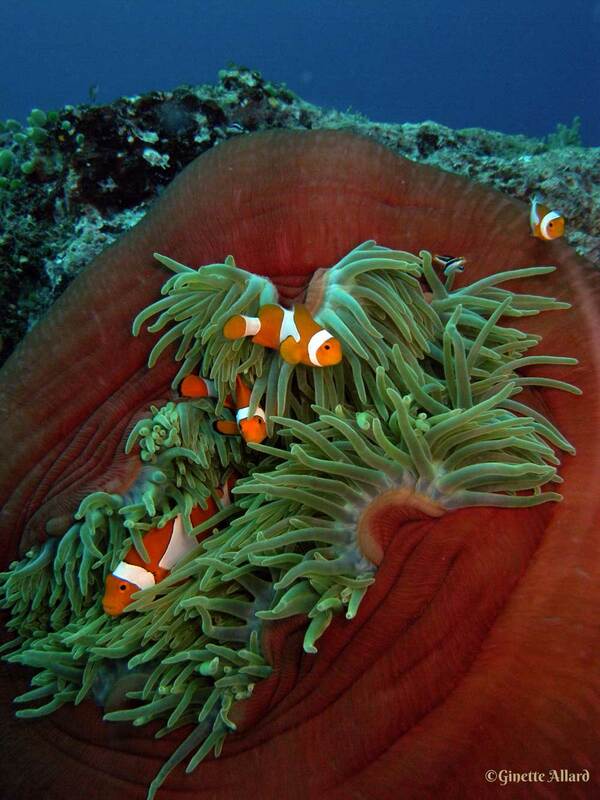 On the western reef the scenery changes to a vertical wall hosting gigantic sponges and colourful soldier fish. At depth, black tip sharks and red snappers cruise while surgeon fish and solar wrasse add vivid colour and life to the spectacle. On the north coast is a sinkhole forms a spectacular underwater archway. 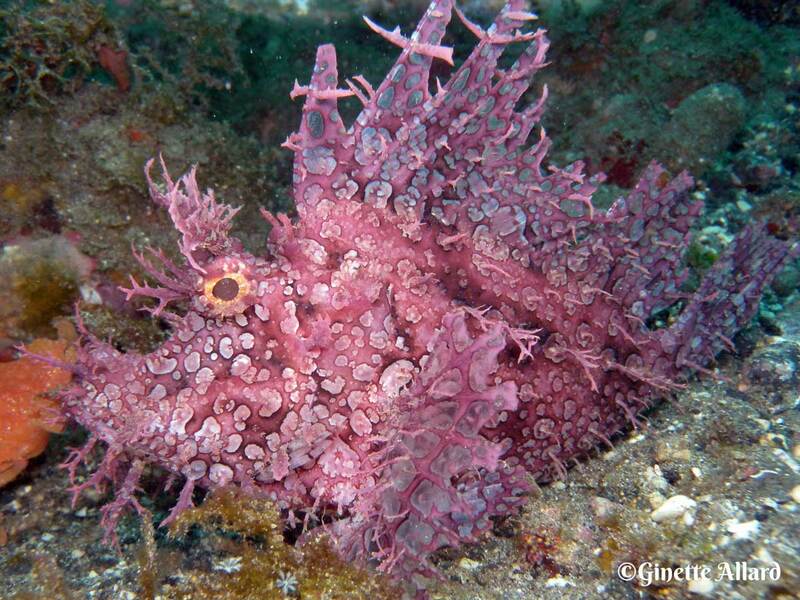 Called Hatta Goa the area is rich in corals, sponges, and gorgonian fans. Walls start close to the surface and plunge beyond recreational diving limits boasting eagle rays and midnight snapper, while ledges house giant clams and provide rest stops for hawksbill turtles. On the shallow reef marine life bursts into colour. 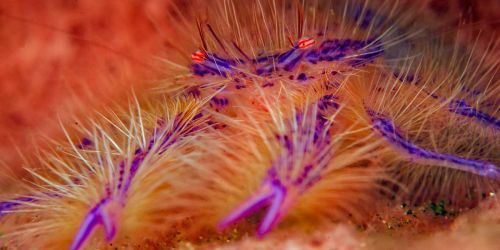 Triggerfish, wrasse, striped catfish and damsels cruise above an amazing variety of anemones, feather stars, and soft corals. Towards the south of Hatta is Pantai Kecil, a very special little beach with superb snorkeling. The reef shelters schools of juvenile teardrop butterfly fish, sweetlips, and nudi-branch. 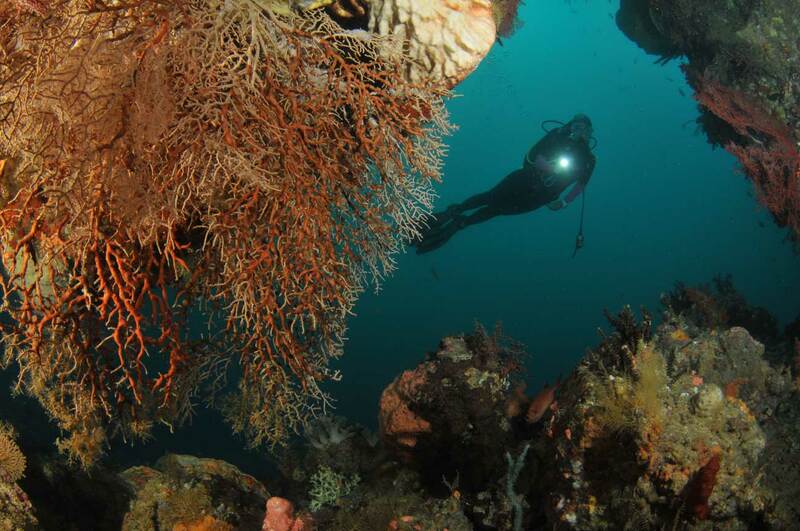 Part of the famous Coral Triangle, most of the Banda Islands are a protected marine area. This is an extension of traditional Bandanese cultural respect for the ocean and a desire to safeguard their pristine marine environment. As connoisseurs of the underwater world please learn and respect the few simple rules for environmentally friendly diving at all times. 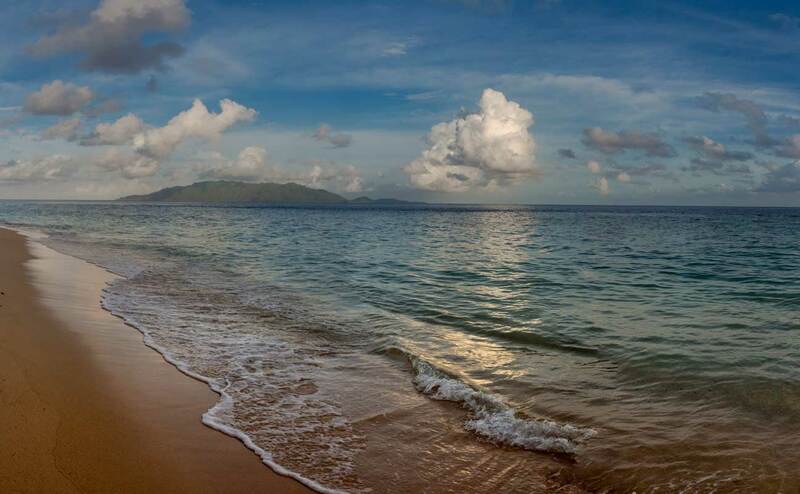 After all, once you visit these lovely islands, you will want to return to the same unspoiled beauty again and again. We will be happy to provide a brief orientation. Batu Kapal - 'Ship Rock' lies northwest of Pulau Pisang. It features interesting topography, enormous gorgonian fans, and barrel sponges. 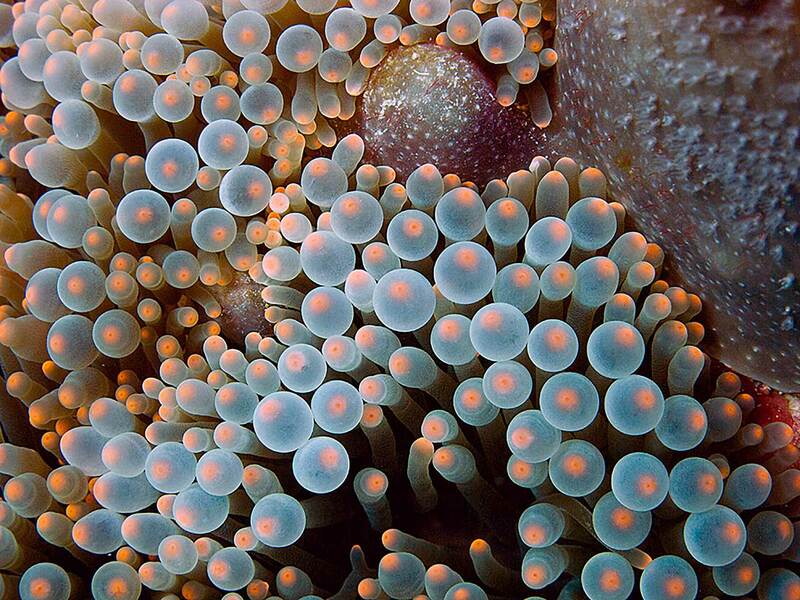 On its west and northern sides are walls with enormous orange gorgonians and barrel sponges. On the southern side are beautiful deep purple ellisella and coral fans with large schools of midnight snapper and big-eye bream. The cylindrical pinnacle to the northwest supports potato cod, moray eels, rainbow runners, long nose emperor, grey reef sharks, and yellow tail barracuda. 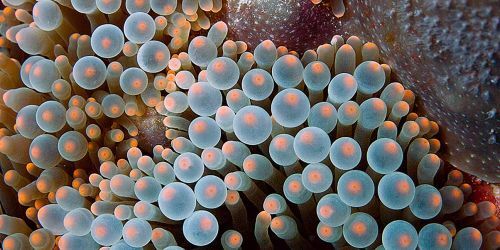 fields of small orange coral bushes and violet blue tunicates are home to honeycomb morays, masses of red-tooth trigger fish, and black-lip butterfly fish. 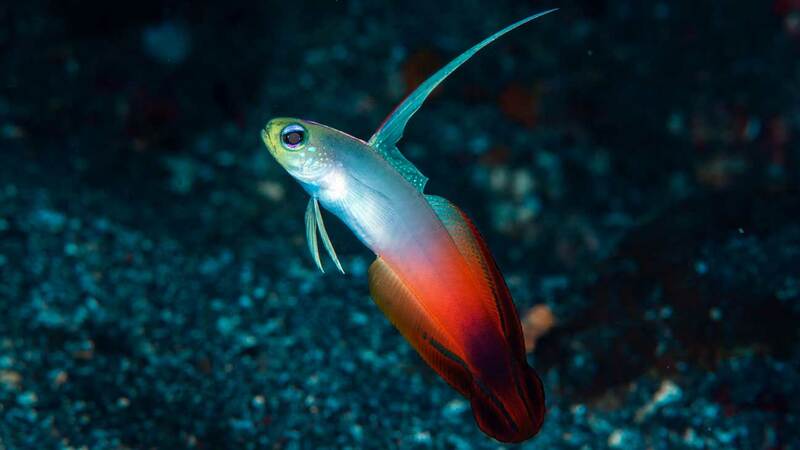 There are many red fire gobies, blue gold tail demoiselles, pink and orange-finned anemone fish, and several species of surgeon fish. When the current is running, Batu Kapal abounds in large pelagic species. KKarnobol located east of Banda Besar derives its name from an old-fashioned Dutch club used to murder many Bandanese in 1621. What makes Karnobol unique are the bommies and outcroppings cloaked in immense colourful gorgonians, sponges, and corals. Napoleon and parrotfish are often seen. Staghorn coral flourishes surrounded by yellow and blue angel fish, surgeon fish, parrot, and butterfly fish which abound. Banda hosts several species of small colourful butterfly fish typically traveling alone or in pairs. Batu Wali - located on the western side of Banda Besar is the core of the islands' protected marine encompassing Pisang, Banda Besar, Banda Neira and Gunung Api islands. It achieved this status due to the astounding coral reefs and being a spawning area for plectropomus grouper. Differentiating this site from others is a wide step in the wall at around 30m. From there the reef plunges steeply to well beyond recreational diving limits. The wide shelf features massive barrel and vase sponges. Large bump head parrotfish, groupers, emperors, Napoleons, and barracuda are frequently observed cruising past the unusual blood red bulb anemone and deep red anemone fish. Thousands of sergeant majors and black trigger fish dart through the seascape. Currents can be strong and unpredictable, including counter currents and upwelling. When conditions are unfavourable this a challenging site. Gunung Api is a volcanic island facing Banda Neira. Its last erupted in 1988 when streams of molten lava flowed into the Sea. The platform provided by the new lava formed ideal conditions for regenerating the reef. 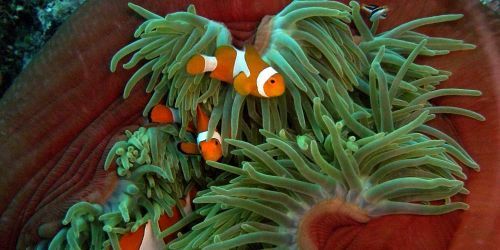 Regrowth rates have been phenomenal, shattering misconceptions about the speed at which corals grow. The size and condition of these new coral formations is stunning. The best diving is along the northern lava flow. In the shallows are tiered table corals, warty finger corals, bottle-brush corals, and acropora. The corals are so densely packed there is little available space remaining. 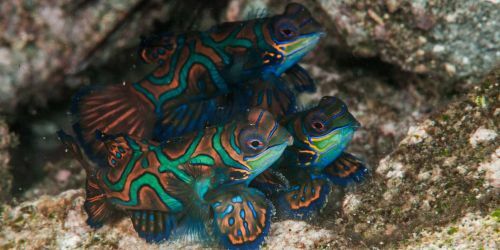 Fusiliers, green-snouted parrotfish, sling-jaw wrasse and cuttlefish are common here, as are triggerfish and shy clown trigger fish with black, yellow, gold, and white markings. Rare black triggerfish are abundant. Rocky outcrops covered in corals, feather-stars, and a sea-fans add variety. Long nose hawk fish patrol the gorgonian fans while feather-stars conceal clingfish and emperor shrimp, perfectly camouflaged to match their hosts. Going deeper, large Napoleon cruise among schools of round and pinnate batfish. 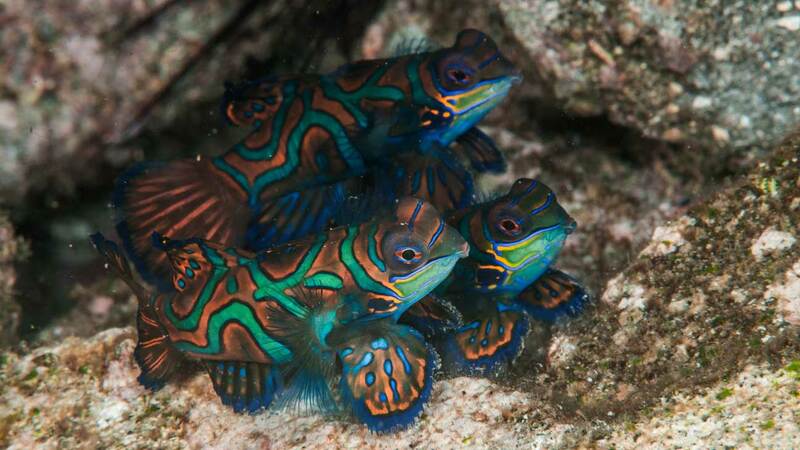 An extremely small shy tropical fish, scientifically known as Synchiropus splendidus, the mandarin fish, is one of the most stunningly beautiful creatures in the ocean. 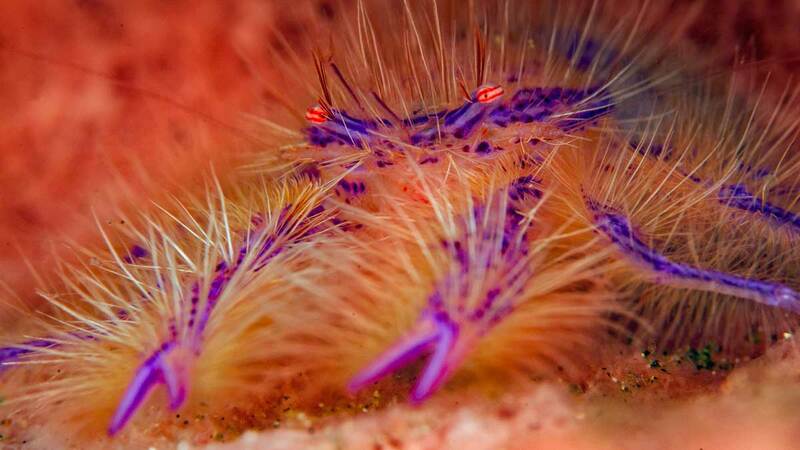 Divers and underwater photographers love to admire its striking beauty and interesting habits. This bashful little fish can be tricky to spot and photograph, since it appears only briefly at dusk to mate. 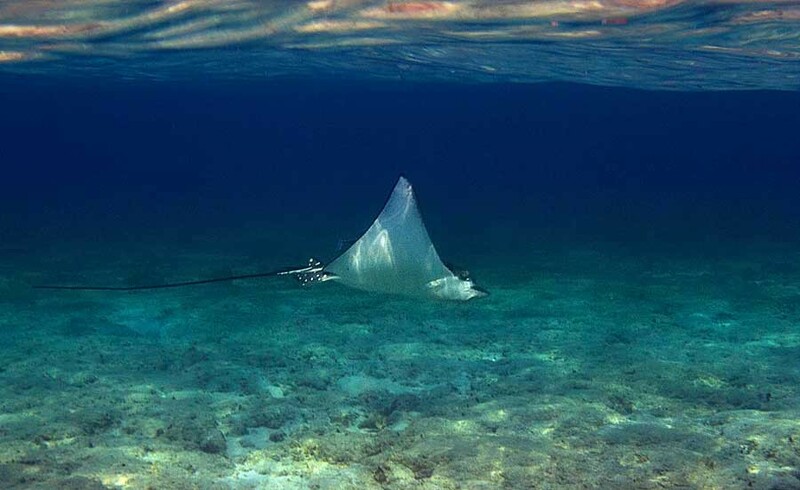 One of the best places to spot them is right behind The Nutmeg Tree guest house and dive shop. 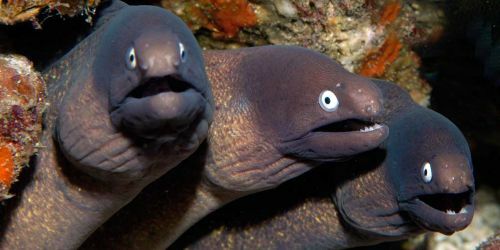 A great excuse for another spectacular night dive. 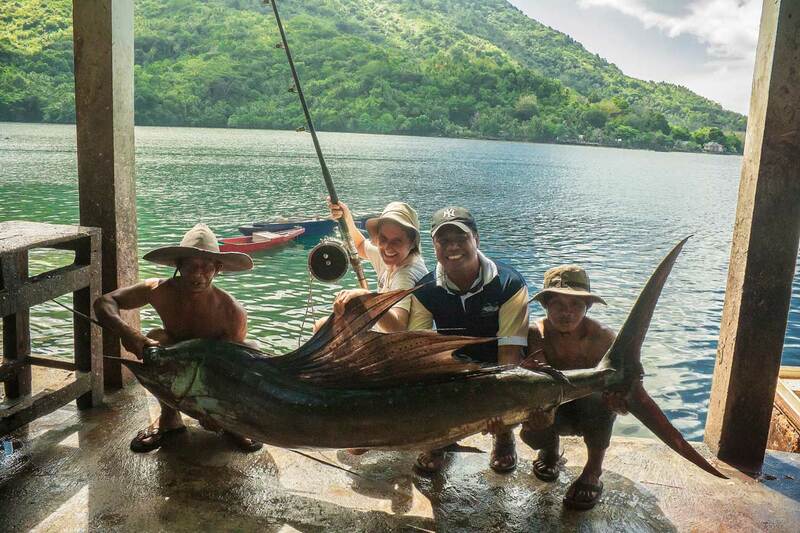 The Banda Islands are a sport fishing paradise. Located along a main migratory route these unspoiled waters abound with Marlin, Broadbill, Swordfish, Yellow fin Tuna, and Wahoo. A fisherman's dream come true, where you end every day on the water tired from fighting fish, rather than bored from staring at the horizon. 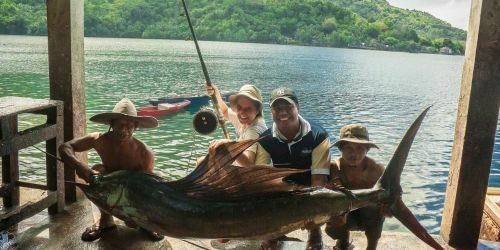 Cilu Bintang Estate will be pleased to make all arrangements for your sport fishing expeditions including the best fishing guide on these islands.